Those who have read my recent posts, Questioning the “Gospel of Marcion,” are now aware of my considered view that Marcion never actually had a textual “gospel.” As I have freely admitted, this view is “contra the totality of scholarship in the field”—today and for the last hundred years. If true, however, this breathtaking assessment must give us pause. After all, what does it say about modern theological research? How can ostensibly serious professors, highly educated, paid by prestigious institutions of higher learning, authoring scores (actually: hundreds) of books—how can all these ‘scholars’ get their specialty so wrong as to reconstruct, critique, and argue ad infinitum about a “Gospel of Marcion” that never even existed? In fact, the boondoggle cannot be laid entirely at the feet of modern scholarship. The error goes back to the Church Fathers themselves. When we look at the words of Irenaeus (c. 180 CE), we see that he clearly implies that Marcion wrote a gospel. But, as R. Joseph Hoffman has noted (below), Irenaeus has not seen any such work of Marcion—he does not even know its name! 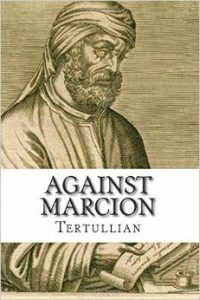 Following Irenaeus, Tertullian in his five books against Marcion (207–08 CE) continues (and expands) the very erroneous implication that he is refuting a written gospel of Marcion. Yet, Tertullian uniformly cites the familiar gospel of Luke, and he does so as witness against Marcion’s theology (“gospel,” evangelium)—not against any cited heretical text. From the very canon that [Marcion] retains, of the Gospel and the Pauline Epistles, I can show with God’s help that Marcion is a fraud and in error, and can refute him very effectively. For he will be refuted from the very works which he acknowledges without dispute. 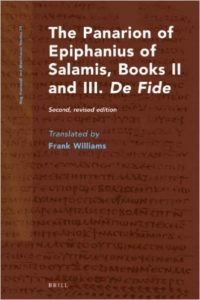 Now, those “works which he acknowledges without dispute” are none other than the canonical texts—which Marcion allegedly “mutilated.” Irenaeus, Tertullian, and Epiphanius are not refuting Marcion from the heretic’s text at all. They are using the canonical texts (Irenaeus, Tertullian) to refute Marcion, and Epiphanius is in turn using what Tertullian writes to refute Marcion. Unfortunately, modern scholarship has gladly fallen into the elaborate trap laid by the Church Fathers. There never was a textual gospel of Marcion. There was merely a lot of self-justifying words written by the Church against Marcion. We may wonder why the Catholic ancients claimed, with such vehemence, that Marcion (“Little Mark”) wrote anything at all? This is a critical question. The only possible explanation for this astonishing state of affairs—one where a strawman heretical gospel is forcefully combated—is that the original pre-Markan gospel was indeed Marcionite! And that fact had to be forcefully hidden—even at risk of extreme measures. We may thus infer that an original pre-Markan gospel was “Marcionite” and anti-Catholic. It embraced heterodox elements stemming from Enochian Judaism (cf. the DSS), including a quasi-gnosticism that devalued the flesh, the creation, sexuality, and pleasure. The proto-gospel preached a higher god and ‘liberation’ from the world. It was much earlier than the 140s CE, but was place in that decade by the Church and attached to “Marcion.” Furthermore, his “Gospel” was accused of being a “mutilation” of the Gospel of Luke—whereas the text under consideration (which I consider the proto-Mark “Hebrew” Gospel) was the first ancestor of GLuke. It may be that Marcion was one of the first notable “Christians” to rebuke the early Jewish Christian community. As he has been depicted, the heretic seems to have repudiated Jewish praxis and the various OT covenants defining the Jews as God’s chosen people. Marcion, then, functioned as an intermediary between the earlier Jewish Christianity and the later Catholic Christianity. Though Marcion (as depicted by the Church) was not Jewish Christian, his Christology shared with Jewish Christianity the views that “Christ” was strictly spiritual and that God never became flesh (what I have termed “Stage 2” Christology). We must speak of Marcion with caution, however, because all that we know of the figure has been gleaned from the hostile pens of the Church. We know, at any rate, that the heretic existed. This basic datum is evident from Justin Martyr’s First Apology (Chps. 26 and 58, written c. 150 CE), where the early Church Father is clearly writing about a heretic who is still living. Beyond such basics, however, we cannot be sure. The later Church got a lot of mileage out of Marcion and may have imputed to him (for convenience) whatever doctrines it most wished to destroy. In any case, by refuting the heretic’s (now clearly) mythical works the Church was repeatedly able to underline elements of the true faith. Perhaps that was the whole point—one first cogitated, it would seem, by Irenaeus. R. Joseph Hoffmann’s 1984 book on Marcion confirms, if nothing else, how very little we know of the heretic. Below, I furnish an extended citation from Hoffmann’s book—minus the many Latin quotes. Hoffmann reviews the astonishing lack of primary source material on Marcion—ironically while himself contributing yet another 300+ page book to the heretic about whom we know so little. After Hoffmann’s extensive citation, at the bottom of this post I offer some final comments. What Marcion thought of the Creator has been the subject of considerable controversy. The confusion arises over apparently contradictory reports in the writings of the fathers, and even within the works of individual fathers. Tertullian, however, made more extensive use of a second source, now lost to us, which reproduced in some detail the substance of Marcion’s evangelion and apostolikon. As he uses Justin’s Dialogue in Book III, here is reason to suppose that Justin’s longer work on Marcion was one of his sources in Books I and II. That Tertullian had access to the Antitheses, or to any other of the ‘writings’ mentioned by Irenaeus, is only a dim possibility. In approaching Marcion’s theology, therefore, one must acknowledge (a) that the most detailed sources available for reconstructing his thought are based not on a first-hand knowledge of his writings, but on a variety of reports, all of them polemical and all, including the earliest [i.e., by Justin—R.S. ], retrospective; (b) that the sources do not supply the wherewithal for retrieving the entirety of Marcion’s theology, but rather supply hints as to its general structure and the themes that inform it; (c) that the later polemic against Marcion deserves little of the historical credit that has commonly been given it, reflecting in the main a later stratum of marcionite belief or an elaboration of earlier anti-marcionite polemic. Comment. From the above, we learn that both Irenaeus nor Tertullian—the two most ‘informative’ Church Fathers regarding Marcion—did not know any of the heretic’s writings first hand. Indeed, it is now clear to me that no textual gospel of Marcion ever existed (see my recent series on Marcion). It is also most probable that no other writings of the heretic existed. After all, Hoffmann writes above: “That Tertullian had access to the Antitheses, or to any other of the ‘writings’ mentioned by Irenaeus, is only a dim possibility.” Now, Tertullian penned no less than five books Against Marcion. An incredible fact thus emerges: the Church Fathers wrote countless pages against a heretic whose writings were actually unknown to them! This reveals the mind games being played by the “Fathers of the Church” in their efforts to consolidate and extend the Christian religion. In Marcion’s case, the churchmen were rebutting a strawman. They created an easy target for rebuttal, one whose demolition underscored the veracity of the canonical gospels (particularly that of Luke). A reading of Tertullian’s prolix diatribe Against Marcion bears this out. Over and over, he critiques Marcion—but Tertullian never actually points to a text of Marcion. On the other hand, he cites the Gospel of Luke ad nauseam and uses it to disprove Marcion—while also claiming that Luke was first! But by the time Irenaeus and Tertullian were writing (late second century) Marcion had died. These Church Fathers apparently felt free to impute to him whatever evils and lapses of logic they desired. Epiphanius is perhaps even more deceitful: he affirms explicitly that his “collection of brief memoranda on my subject [are] taken from authentic copies of Marcion in the form of notes” (Panarion 42.11.15). The evidence, however, doesn’t indicate that Epiphanius was using Marcion. It indicates that he was using Tertullian! It appears that Marcion served as a catalyst to further the faith. He indeed existed, and his theology (as depicted) was most dangerous. We can infer that Marcion essentially represented what I have termed “Stage 2 christology”: belief in the spiritual Jesus and—the corollary—belief that the material creation is essentially evil and, hence, that God is foreign, transcendent, and “other.” However, Irenaeus and Tertullian were not merely interesting in combating this heresy. They argued in extenso against it in order to demonstrate two other and very pressing goals: that the canonical gospels were early (in this case, earlier than Marcion), and that the twelve apostles were the repository of the truth handed down in unbroken lineage from Jesus of Nazareth, as depicted in those same canonical gospels. These were the goals that Irenaeus and Tertullian wished to accomplish. They simply used Marcion for convenience—and the heretic was indeed extremely useful to them. As noted in another post, the defining religious combat of the second century was the combat of christologies: the Church’s Stage 3 (“Jesus of Nazareth”) against the older Stage 2 (Jesus as spirit). 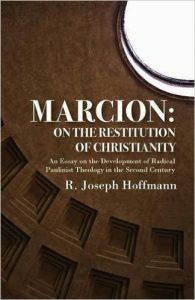 Marcion may have been the quintessential representative of that older—and more authentic—christology. Marcion also has always been linked with Paul—the heretic’s hero. For Paul, too, Jesus was spiritual and accessible through revelation (cf. Gal 1:11–12; discussion at NazarethGate pp. 408–11). In closing, I find it curious that both Marcion and Paul bear names that are diminutives. “Marcion” means Little Mark. “Paul” means little. Is this purely a coincidence?—R.S. 1) Irenaeus convinces himself that the Ebionites have corrupted Matthew; the docetists, Mark; the Marcionites, Luke; the Valentinians, John. Any thoughts on how he arrives at this notion? RS: My hunch is that the reflexive accusation of corruption (“mutilation,” etc) by the Church is a clue that the Ebionites, Docetists, Marcionites, and Valentinians in each case actually came *first*–supporting a Late Chronology (II CE for the canonical gospels). RS: ISTM that the gospel and epistles apparently had different trajectories, dates, and histories. Their theologies are different–the epistles are Stage 2, the canonical gospels are Stage 3. In other words, there may be some I CE elements in the epistles, even if they were not by Paul or Marcion. Detering is working on a new edition of his 1994 book that should shed some light on this. 3) Would not the marcionite iteration of your postulated Ur-Mark fit the bill for the evangelion ? RS: I haven’t been able to find a “marcionite iteration.” The 16 posts dealing with GMk (now on this site) have no lines that are marcionite (though I include a descriptive paragraph of the marcionite Stage 2b theology at the top). My reconstruction is thoroughly provisional, of course, and could well be wrong, but I’ve been able to analyze GMk entirely with Gnostic (Stage 1), Jewish-Christian (St 2a), and Catholic (St 3) elements. One could argue that the marcionite elements were once there and then expunged by the Church, but we still have no surviving marcionite gospel. Detering’s Paulusbriefe ohne Paulus has been re-released a few months ago. I find it curious that both Marcion and Paul bear names that are diminutives. “Marcion” means Little Mark. “Paul” means little. Is this purely a coincidence? Plays on words seemed to have been popular and significant in this milieu. Though it may be hard to put a finger on what exactly was behind these diminutives, something is definitely going on here. What are your thoughts on the similarity of the names Paul, Apollos, and Apollonius of Tyana? Apollos is mentioned in Acts as teaching a gospel that knew only the baptism of John. Apollonius was a greek philosopher that traveled the same paths as Paul as he criss-crossed the region teaching and performing miracles. Is the name Paul a diminutive of Apollonius? Could it be refering to the small Marcion who used Apollonius as a template for his teachings? These are good questions. I hadn’t thought of the connection between “Paul” and “Apollos” or “Apollonius”… What I find most important at this time is that some of us are (finally) beginning to grasp the enormous chicanery represented in the New Testament. That’s good. The answers cannot be far off, if we just have the ability (and skepticism) to doubt everything. Marcion indeed seems to have been a figure from history. “Paul,” on the other hand, increasingly appears to be mythical. I cannot see anything historical in Apollonius of Tyana. The biography of Philostratus had been written by an imperial scribe of the Severan dynasty, whence the reasons are to be thought as political.